Brace yourself. It is going to be a very long, laborious, and labyrinthine road to recovery. You know how people say, “Life is a roller-coaster”? Well, you have been launched into the mother of all roller-coasters that would make the Six Flags ‘Full Throttle’ look like child’s play! Ground yourself, quick, because he is having it worse than you are. The silver lining, however, is that you have lived through the most harrowing days; making it out of the Neuro ICU. Each step of this jarring journey is going to test your patience, your calm, and your resolve. My sister keeps reassuring me, “It is very hard to see, but it is all upwards from here.” And you have to hold on to this with everything you have and push yourself to hope for the best. Before you get your head wrapped around rehabilitation, it is imperative that you know that rehabilitation is not a quick fix magic potion. Not one therapist, or one facility can get them all the rehabilitation they need. Unlike an open heart surgery, or a broken bone, recovery from a TBI is mysterious. Unfortunately, however, it is estimated that most of the brain development occurs between 6 months to a year after the accident, after which the recovery plateaus. And so, you want to give them the most and the best rehabilitation in these months. Time is going to seem very relative; at one time you will feel time slipping away like sand in a sandclock, and at another it will feel like time just stopped and you see no progress. But, Be very patient. It is a highly confusing and agonizing recovery for TBI survivors. Depending on their injuries, they might have to start learning basics all over again; from learning to walk, to talk, to pick up a bottle, to unlock the door, to wear clothes. It is going to be tough. On them and on you. Expect that. And be patient. There is not one simple path back to recovery. It is both subjective to each one’s case, and objective to each one’s insurance coverage. Ideally, you want to make the path through all the rehabilitation institutions before you get home. There is a lot of learning when it comes to insurance coverages, and you should learn your own plan well. Jitish started off from the UW Madison Hospital making our way from the trauma unit. We spent 41 days in the Neuro ICU unit, under one-on-one strict observation. While the next step for Jitish could ideally be rehabilitation, we had to help Jitish work on his breathing before we could even be accepted to a rehabilitation program. UW Madison has its own rehab program, however Jitish didn’t qualify. There are two kinds of rehabilitaton programs – Acute Inpatient Rehabilitation that requires a minimum of 3 hours patient participation and Sub-Acute nursing facility rehabilitation which requires 1.5 hours patient participation. Jitish, at the time, couldn’t participate in either programs and so we made our way into a Long Term Acute Care Facility at Lifecare Hospitals. The focus here was to get him breathing on his own, and finally get rid of his tracheostomy. The term – Long Term Acute Care is unnerving. I had no intentions of leaving Jitish at a facility longer than he needs to be there. I was very aware of the time slipping by. 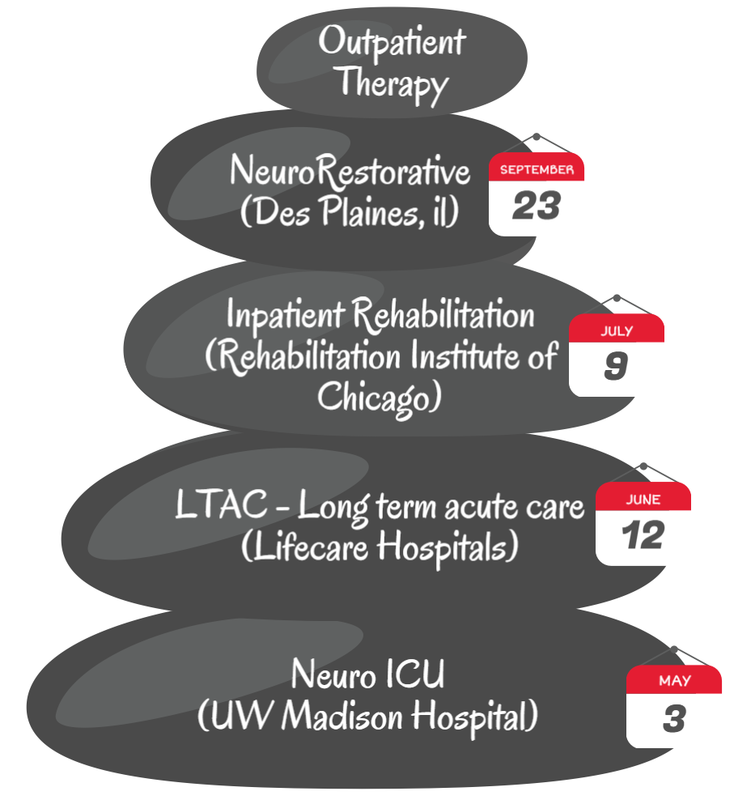 There were two rehabilitation programs around our area – Sacret Heart Milwaukee and Rehabilitation Institute of Chicago. After appropriate research, feedback and tours of the facilities, I made the right choice of going to RIC, Chicago. I count our blessings everyday, for being close enough to RIC to have Jitish undergo his Rehabilitation there. From July 9th to September 23rd, we saw Jitish progress from being in Coma Recovery, to being able to walk, talk, eat and gain awareness. While, I would have preferred Jitish coming home straight from RIC, life had something else planned for us. It just wasn’t time, I believe. We are now at Neuro Restorative at Des Plaines, Il undergoing to next stage of Rehabilitation, in the hope of going back home soon. In the hope of someday soon. Previous Post Careless or carefree? Be proactive with your finances! Next Post First day, away. Great blogs, heart rending, more so when we know you for a long time, this has touched our hearts immensely. Dear Susheela Aunty, It is unfortunate that the only thing that I am sharing now is the aftermath of the accident. I hope the story has a happy ending and in the process we can help as many people find strength. Thank you for your good wishes and prayers.